A generation after Salazar's fall, Portugal's once-sleepy capital has officially emerged from its former malaise. Experience the old-world charms and high-design energy of a city that is seducing both travelers and native Lisboans alike. I knew it was going to be a good party when I saw the door vixen. Not only did she look like the love child of Grace Jones and Leigh Bowery—seven feet tall and dipped in cherry-red PVC—but she wouldn't let the glossy-magazine photographer through the door without a mask. It takes a conﬁdent host to force habitually nonconformist media people to obey a dress code. But with or without the help of the press, promoter Manuel Reis and his crew could afford to be upbeat about their Malicia in Wonderland Fetish Ball, held on that breezy night at Reis's megaclub Lux, on the Santa Apolónia docks in Lisbon. The parking lot alone was a madhouse. To the left of the door was the fresh-faced Portuguese publicist for Louis Vuitton, dressed as a Roman centurion; behind him stood a troop of Boy Scouts in short-shorts and pumps. Here an astronaut in lipstick, there Francisco Capelo, Lisbon's leading art collector, and his strapping date, both in hundred-year-old Indonesian dragon masks and floor-length feather skirts. All my group had to do next was clear the stiletto-heeled courtiers on the staircase, and then we'd be watching Marilyn Manson's luminous girlfriend (now wife), Dita Von Teese, strip down to a constellation of rhinestone pasties and writhe around on a spotlit bed, which had been hauled in for the night. Since the 1980's, when Reis opened his first dance club, Fragil, in the neighborhood of Bairro Alto, Lisbon has been known as a town that can get down. Electronic music fans, and the house and techno DJ's who serve them, have long seen the city as a mecca. But there's a spirit of celebration in the air today that's not only for music lovers but also for foodies, design buffs, and aficionados of boutique hotels. "People who have not considered Lisbon as a destination before are considering it now," says hotelier Grace Leo-Andrieu, whose GLA International group manages the airy new 55-room Bairro Alto Hotel straddling the upscale shopping district of Chiado and the earthier Bairro Alto. Leo-Andrieu can choose almost anywhere in the world to open a new place—GLA's portfolio includes the Lancaster in Paris and Mustique's Cotton House. But with the number of American tourists to Lisbon up 5.8 percent, according to the most recent statistics, and European travelers running a close second, Leo-Andrieu is tapping into what she thinks is Lisbon's moment: "There's a feeling of discovery here," she says. Discovery is an ironic idea to associate with this ancient port, the launch site of all those voyages to India, Africa, and Asia that we should have remembered from history class. It's an apt one, though, and not just for tourists. From the 16th century to the 1960's, the Portuguese were the leading émigrés of Europe. Gradually, however, especially since Portugal joined the European Community (now the European Union) in 1986, lisboetas have awakened to realize that their city is a nice place to come home to, and stopped wanting to take the first boat out of town. "Sure I'd love to live in New York or Paris one of these days, but only temporarily," says my friend Paulo Macedo, Vogue Portugal's fashion director, who has lived in Lisbon and the nearby beach suburb Carcavelos for nearly 20 years. "The quality of life here is too high to walk away from." We're having this conversation over dinner at Pap'Açorda, a casual minimalist mainstay in Bairro Alto that serves top-notch Portuguese soul food to the city's fashion and arts elite. As he ﬁnishes off a smooth Alentejo red and the densest, blackest chocolate mousse I've ever seen, Macedo looks around the marble-walled room, its vases exploding with pale pink peonies, its ceiling dripping with Murano glass. "You cannot get what we have anywhere else," he says—certainly you can't get that pudding, some of which he gallantly saves for me—"it's just that it took us a little while to realize it." When I first visited Macedo and his wife in their sunny central Lisbon apartment last year, I would have found it hard to believe that it would take a burgeoning nouvelle cuisine movement or new glut of day spas to remind natives and visitors alike of Lisbon's long-standing appeal—what Francisco Capelo, the 50-year-old owner of the Museu do Design in Belém, characterizes as "living in Santa Monica surrounded by 800 years of art." It's not as if the light from the Tagus, the river on the city's southern border, never showed off the 18th-century architecture before. Or that Lisbon suddenly grew some neighboring beaches and turned balmy nine months a year. The spectacular wine did not recently become cheap, the seven hills and their dramatic views did not just spring up. But then, living under a fascist dictatorship, as the Portuguese did until 1974, tends to dull one's appreciation of the motherland. Even under ideal conditions, it takes a good many years to shake off the political and social gloom of fascism—single-party elections, aggressive secret police, and an unsettled economy usually overshadow the joys of piquant olive oil and cunning handicrafts. After the fall of Antonio da Oliveira Salazar's regime, it was a decade before the Portuguese government stabilized. Another few years had to pass before EU membership culturally fused the Portuguese to the rest of Europe—which, until then, tended to consider Portugal an unwashed backwater at the underside of the world—and rebuilt the country's pushcart of an economy into something combustible. By the second half of the nineties, it was a different story. Portugal's qualification for the euro in 1998 provided a further ﬁnancial boost, and the nation's infrastructure got a tremendous upgrade when the World Expo came to town that same year. (Says one expat friend, a German beauty editor who has lived in Lisbon for 22 years: "Before Expo, it was as if we didn't have roads.") Lisbon Expo '98 was also responsible for the rehabilitation of the once putrid docks that now house Manuel Reis's Lux, its painfully chic sister restaurant Bica do Sapato (co-owned by Reis and actor John Malkovich), mid-century Modernist furniture boutique Lojadatalaia, and a brand-new fine-foods emporium, Deli Delux. Since 2001, about one-third of the city's abandoned buildings have been renovated on the government's dime, with more lined up. And boutiques from independent fashion designers are popping up on every grafﬁti-etched corner of Bairro Alto. Even the prime minister, José Socrates, wears Prada. A further infusion of capital and cleanup came with the Euro 2004 soccer championships. Not a total cleanup, mind you: this is no spit-shined capital like Copenhagen. Take, for example, the popular Cape Verdean dance party I attend at a former slave owner's mansion (no kidding) in the riverside district Santos. The overgrown, ramshackle garden courtyard and peeling, formerly grand frescoes in the main ballroom are more sensuous than sad—the tumbledown state of things certainly hasn't stopped the sixtysomething former head of the Portuguese Bar Association from visiting. And nobody seems to mind crunching through the hundreds of plastic drink cups left behind by all those fauxhawked hipsters partying in the streets of Bairro Alto. By 2:00 a.m. on any weekend, when the last packs of chatty photographers and DJ's and graphic designers and rowdy teenagers ﬁnally leave A Capela on Rua Atalaia, or Bicaense on Rua da Bica de Duarte Belo, or any other of the dozens of dimly lit techno-music bars they've flitted into and out of all night, the sight (and sound) of those cups is almost sweet. Besides, they'll be gone in the morning, when stray cats and old ladies resume their daytime dominion of the place. Just as Lisboans have enjoyed their city's renaissance, so has the international party circuit. For reasons of geographical convenience, touring rock musicians have often ended their European legs in Lisbon, and for the past two years the glitzy Laureus Sports Awards, held in the suburb of Estoril, have brought their own celebrants. And last November, the MTV European Music Awards—the ultimate pop recognition—arrived. "You just have to hope Lisbon doesn't become like Barcelona and lose its traditional flavor," Leo-Andrieu says. So far, that hasn't seemed to be a problem. In fact, after a generation of fascist malaise, lisboetas are embracing the city's old customs, even those that are still a bit redolent of Salazar. A case in point is fado. The mournful national song of love and loss (fado literally means "fate") was actively promoted by the dictator. The lisboetas I know still turn their noses up at fado clubs, which they consider touristy. But invite a local to join you at a place like Sr. Vinho, a low-ceilinged boîte in the quiet Lapa neighborhood, and you'll see your friend silently mouthing the words as the shawl-draped fadista wails along to the acoustic guitar. Almost everyone has a favorite singer—usually it's Mariza, the striking, half Mozambican superstar with the marcelled platinum-blond bob and global critical acclaim. Another instance of locals' appreciation for the ambiguous beauty of a checkered past is the enduring social centrality of Lisbon's Four Seasons Hotel the Ritz, a jaw-dropping example of high Modernist glamour that Salazar commissioned through a consortium of local moneymen in 1953. Lisbon had been a big travel hub during World War II (Portugal was officially neutral), but its old-world hotels—the regal Pestana Palace and rococo Avenida Palace, to name two—lacked the cosmopolitan flair that Salazar wanted to project to the outside world. He realized his dream in the Ritz, a capacious, gilt-edged sanctuary with museum-quality sculptures and tapestries on every wall. Now managed by the Four Seasons, the Ritz's hyper-tasteful restaurant Varanda continually attracts a boldfaced mishmash of captains of industry and society doyennes. The light nouvelle-Portuguese menu is predictably strong on seafood, and during lunch, the action hovers around the decadent buffet. In 2003, an appropriately luxurious, 16,000-square-foot spa and a pool were added to the storied hotel. With its tall panels of polished dark wood, high ceilings, and Zen-like relaxation rooms, the facility has become such a destination for locals that the hotel now sells spa memberships. Lisbon's ever warmer embrace of the past reaches further back than the mid 20th century. Portuguese architect Miguel Cancio Martins, the designer of Paris's Buddha Bar and New York's Man Ray, is ﬁnishing his makeover of a late 18th-century mansion on the grand, tree-lined Avenida da Liberdade for Lisbon's Hoteis Heritage group. But, he tells me, it's been his fantasy to build in the oldest part of the city. He's not alone in his ardor for the Alfama, a windy, steep-hilled maze of a neighborhood that dates back to the eighth century—it's already the site of two smart boutique hotels created from old castles: the Heritage group's three-year-old yellow-washed Solar do Castelo, a former 18th-century maisonette inside the walls of a Moorish castle; and the elite, eccentric Palácio Belmonte, an 11-room, antiques-filled oasis fashioned from a 15th-century house. If you walk through Belmonte's brightly painted, eclectically decorated rooms, you'll never see a chambermaid. There's no concierge, not even an on-site kitchen, but make a call to the manager and within 15 minutes whatever you want will be arranged. Not that shiny new venues are getting short shrift. Droves of locals make weekend-afternoon pilgrimages to the Parque das Nações, which was commissioned for Expo on what used to be a dingy industrial wasteland northeast of central Lisbon. Now it's a large garden adjoined by striking examples of contemporary architecture, especially Alvaro Siza's spaceship-style sports arena and exhibition hall, Pavilhão de Portugal, and Peter Chermayeff's Oceanário, the second-largest aquarium in the world. Perhaps the Michelin guides are still too busy with Spain to give Portugal adequate attention, but then again, the Portuguese are not exactly masters of public relations. After countless interview requests, I'm still waiting to hear from Manuel Reis. Everyone tells me not to be offended: the man is simply too shy to talk. "Maybe it's because Portugal was such a big empire in the 15th and 16th centuries," proposes Francisco Capelo, Lisbon's resident art mogul and man-about-town. "The very idea of empire inspires nostalgia—and a feeling that you're nothing now. I think this makes the Portuguese sweeter, less aggressive. Compared with the Span-ish, we're certainly lower-profile." Sure, the Portuguese as a whole are notorious introverts, but not Capelo himself. And thank heaven for that. A puckish firecracker with contagious joie de vivre, he invites me to ﬂip through photo albums of his past parties and galas. It's like Where's Waldo with wardrobe by Jean-Paul Gaultier: Capelo's toothy grin pops up in every picture. We're sitting in his Alfama town house discussing his unusual lack of Portuguese bashfulness when Capelo erupts, "I like me," and laughs. "And I like things." A look around his house is evidence enough of that: imagine three stories stuffed with 17th-century illuminated Ethiopian manuscripts, photos by Man Ray and Tracey Moffatt, Chapman brothers sculptures, Ettore Sottsass furniture, and hundreds of Indonesian puppets. Now retired from two lucrative careers, in investment banking and the media, Capelo has become addicted to acquiring, but he's generous with his goodies. Ten percent of the Berardo Collection, the wonderful modern-art museum in nearby Sintra that Capelo and his former partner José Berardo created, was selected by Capelo. All of the 1,000 or so pieces at the Museu do Design, housed since 1999 in a corner of the Centro Cultural de Belém, 20 minutes outside the city center, were first bought for his private use. That collection—rich in works by design superstars like Gio Ponti, Arne Jacobsen, Alvar Aalto, and Michael Graves—is among the best of its kind in Europe. Capelo also hopes to create an Asian wing for the Museu de Arte Antiga in Santos, to house his Moghul and Chinese furniture and Indonesian puppets and textiles. (For now, he's content to help me look under the skirts of the marionettes in his sunroom, to prove that they are anatomically correct.) And he is in negotiations with the government to open a fashion museum in Lisbon. Among the 1,160 couture pieces he's waiting to show off are the yellow Jean Desses gown that Renee Zellweger wore to the 2001 Oscars and three gems from Christian Dior's landmark 1947 New Look. And though the minister of culture has been a little slow coming up with the right venue, Capelo is not tempted to decamp his project to Paris or London, where he has additional residences. His treasures are intended strictly for Lisbon. And why not?In a town like this, they'll be in awfully good company. Lisbon is a sun-drenched city, but thanks to the Tagus River and the Atlantic Ocean, there's always a breeze. August is the only month when temperatures can become uncomfortably hot. In winter, the breeze gets chilly, but the mercury rarely dips below 50. Continental and Air Portugal operate direct flights from North America to Lisboa International Airport, which lies just outside the city. 8 Praça Luís de Camões;351-21/340-8288; www.bairroaltohotel.com; doubles from $410. 88 Rua Rodrigo da Fonseca; 800/332-3442 or 351-21/381-1400; www.fourseasons.com; doubles from $381. Stylishly simple and affordable rooms. 180B Avda. da Liberdade; 351-21/351-4060; www.nh-hotels.com; doubles from $203. 14 Páteo Dom Fradique; 888/222-8859 or 351-21/881-6600; www.palaciobelmonte.com; suites from $352. 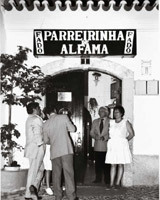 2 Rua das Cozinhas; 866/376-7831 or 351-21/880-6050; www.heritage.pt; doubles from $230. A peaceful, antique pension that has been renovated in a modern style. 32-1 Rua das Janelas Verdes, Lapa; 351-21/396-2435; www.yorkhouselisboa.com; doubles from $176. A local favorite with a Belgian-inflected menu that is hearty yet refined. 12 Travessa do Convento das Bernardas; 351-21/390-2034; dinner for two $88. The restaurant's glam factor spills over into the less expensive, adjoining café. Armazém B, Avda. Infante Dom Henrique; 351-21/881-0320; dinner for two $117 (restaurant) or $82 (café). A menu that mixes Italian dishes (risottos, pastas) with Portuguese ingredients (black pork cheeks, prawns). 35 Rua Santa Marta; 351-21/315-0212; lunch for two $35. 57 Rua da Atalaia; 351-21/346-4811; dinner for two $129. Some of the best vanilla custard pastéis de nata 57 Rua Dom Pedro V; no phone; dessert for two $10. Jardim Amália Rodrigues, Rua Marquês da Fronteira, Parque Eduardo VII; 351-21/386-2211; www.restauranteleven.com; dinner for two $164. Portuguese comfort food opposite Igreja São Miguel, a church you can find only by asking directions. 7 Beco de São Miguel; 351-21/888-1328; dinner for two $47. Brightly colored, fashion-forward dresses, skirts, and tops. 112 Rua da Rosa; 351-93/633-7795. Chic ready-to-wear suits and couture gowns from Portuguese society's designer team of choice. 15B Rua Serpa Pinto; 351-21/346-0690. An Art Nouveau jewelbox crammed with chocolates, port, and other goodies, in the center of Chiado. Fine foods and wines (assemble a case to ship home some of the local vintages). Armazém B, Loja 8, Avda. Infante Dom Henrique; 351-21/886-2070; www.delidelux.pt. A collection of well-priced vintage jewelry, including excellent pieces from the forties and fifties. Though you're unlikely to schlep home a Knoll chair, don't miss a trip to Manuel Reis's design-furniture boutique, a stone's throw from Bica do Sapato. Armazém B, Loja 1, Avda. Infante Dom Henrique; 351-21/882-2578. This glove store has butter-soft lambskin creations that rival anything on the Paris runways—for hundreds of dollars less. 87A Rua do Carmo, Chiado;351-21/342-0295. Centro Cultural de Belém, Praça do Império; 351-21/361-2400; www.ccb.pt. This 840-acre park is centrally located right next to the Oriente train station. This Romanesque cathedral houses 12th- and 13th-century treasures, and the adjoining cloister has an archaeological dig with remains of Roman times. The sound system is extra powerful and the crowd is scruffy-cute—intentionally so. Frequented by intellectuals and people from the arts, theater, and cinema. 45 Rua Atalaia;351-21/347-0072; no cover. Infante Dom Henrique, Santa Apolónia; 351-21/882-0890; cover for two $14. 18 Rua do Meio a Lapa; 351-21/397-7456; minimum cover for two $26, dinner for two $94. By José Saramago. This 1992 magical realist novel from Portugal's leading man of letters tells the story of Inquisition- mad 18th-century Lisbon—and helped earn Saramago a Nobel Prize in Literature. By Erich Maria Remarque.From the author of All Quiet on the Western Front, the adventures of two refugees desperate to leave the port city as the Third Reich tightens its grip across Europe. Senhor Vinho, in Lapa, is owned by well-known fadista Maria da Fe; as such, it is an ideal restaurant for hearing Lisbon's unique fado music. The "Portuguese blues", popular since the 1820's, consists of mournful ballads about loss, painful love, and life's difficulties. It is accompanied by an acoustic guitar played with Middle Eastern influences. Exposed beams, tile and plaster walls, brick arched doorways, and dark wood accents set the stage for the fadistas. Signature dishes include the lobster with rice, pork loin with rice and tropical fruit, and lagareiro octopus. Droves of locals make weekend-afternoon pilgrimages to the Parque das Nações, which was commissioned for Expo on what used to be a dingy industrial wasteland northeast of central Lisbon. Now it's a large garden adjoined by striking examples of contemporary architecture. The butter-soft lambskin and leather gloves rival anything you'll find in Paris, but at bargain prices. The shop's collection of well-priced vintage jewelry includes some excellent pieces from the forties and fifties. This Art Nouveau jewelbox in the center of Chiado is the place for chocolates, fine coffee, and other gourmet treats. A delicious array of rainbow-colored, fashion-forward dresses, skirts, and tops hangs from meat hooks in this converted butcher shop. Tucked away up the stairs from the Travessa Terreiro do Trigo and down the San Miguel alley is the restaurant Santo Antonio de Alfama. The three-floored restaurant is done in glamorous cinema-style, with wood wainscoting, red velvet seats, stage lights, and black and white photos of famous actors and singers. Meals begin with complimentary deep fried potato skins with aioli. The best deal is to order a round of starters to share, such as mushrooms stuffed with Gorgonzola, whitebait fried in batter, and breaded brie with raspberry jam. In nice weather, sit on the terrace overgrown with grape vines. A sleek space in the Amaliá Rodrigues garden of Parque and Michelin-starred chef Joachim Koerper’s ambitious Mediterranean menu cemented Eleven’s popularity from the moment it opened. The tiles of the Pastelaria-Padaria Sao Roque claim it is the "Cathedral of Bread", but the bakery also serves up delicious sweets and savories as well. Located on the northern edge of the Bairro Alto, the pastelaria is filled with an ornate dome ceiling, bronze-colored marble columns, curved counters, and art deco azulejos with intricate designs, bright colors, and nature scenes. Locals come here to enjoy treats such as pasteis de nata (custard tarts), meringues, coconut-dusted pao de deus (God's bread), and codfish cakes. There is ample seating indoors but several outdoor tables allow for people-watching during nice weather. In the mostly commercial Uptown district of Lisbon is Luca, a contemporary, whitewashed dining space that uses Portuguese ingredients like black pork cheeks and prawns in traditional Italian pastas and risottos. Located in the quiet Lapa neighborhood, the York House hotel is a converted Carmelite convent built in 1606. The surrounding garden and terraces allow for relaxation but the National Museum of Ancient Art, the Rossio square, and the Castle of Sao Jorge are all nearby. The 32 rooms, renovated in 2003, are individually decorated, with wood or antique brick floors, marble bathrooms, accents of wood and tile, and 18th century-style furniture. The bar is located off the terrace, and the restaurant is done with wainscoting of azulejos, crystal chandeliers, and smoky-blue accent walls; French-Portuguese cuisine is served there. Located between the shopping of Chiado and the nightlife and eateries of Bairro Alto, the Bairro Alto Hotel is housed in an ocher, 19th-century baroque building that overlooks the Luis de Camoes square. Restored in 2001, the 55 rooms blend colonial style and modern sensibilities — painted paneled walls, muted blues, grays, and browns, Brazilian hardwood floors, and modern art. The Flores restaurant serves Portuguese cuisine, while Cafe-Bar BA, with its geometric stained glass windows, has live music and light fare. The BA Terrace has views of Rio Tejo and the old Lisbon rooftops.